My grandfather Dr. Gurbaksh Singh Nayar, or as we called him ‘Papaji’ was a well known practising doctor. His brothers and he owned a lot of real estate property in the North Eastern Punjab Province Sialkot‘s “Nayar Bazar” (now Pakistan). The market comprised of 34 shops with residences above. Nayar Bazar was a major section of the famous Trunk Bazar of Sialkot. Till the late 1980s, a board bearing this name of the Bazar was still on display. My grandfather and grandmother, Purandei Nayar whom we called ‘bhabiji’, had three sons. The youngest of whom was my father. In June of 1947, murmurs of communal troubles were in the air. My father was then a third year MBBS student of Balakram Medical College which was established by Sir Gangaram in Lahore. (It was re-established as Fatima Jinnah Medical College after it was abandoned during partition). Hearing of riots around the area, the eldest of the two older brothers, who was also studying medicine in Amritsar, tried to convince my grandmother to sell her savings, which were in form of silver bricks and the basement of their haveli (mansion) was stacked with them. Partition was imminent, yet my devout Sikh grandmother rebuked her sons, saying that should they sell the silver: “Loki kahangey ke nayaraan da divalaya nikal paya“! (“People will say that we are bankrupt!”). I was born in the 1960s, and had heard horror stories about Partition from my paternal grandmother, ‘bhabiji’. 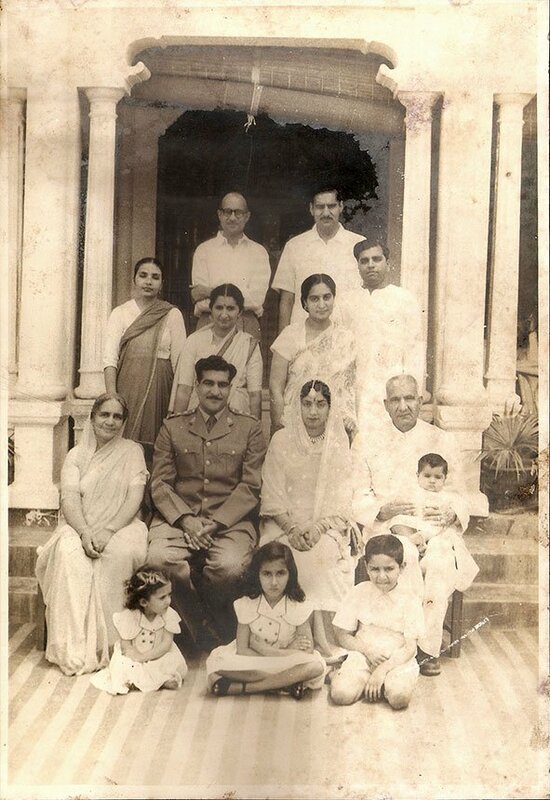 On August 14, 1947, the family was eating their brunch and actually saw the Sialkot police running away from the rioters and that is when the family then knew it was time to leave. After collecting their valuables, my grandfather first hid with his wife and three sons in the house of a dear friend Ghulam Qadir who owned a departmental store, then later in the Sialkot Jail where the Superintendent Arjun Dass was a patient of his. (Arjun Dass, later as the jail superintendent of Ambala Central Jail supervised the hanging of Nathuram Godse, Mahatma Gandhi’s assassinator). A few days later, they had crossed over to Amritsar with two trunks – one filled with gold jewellery and the other with silver utensils. The trunks were carried by a two servants, Nanak, a young boy, and Munshi Ram. Whilst crossing the River Ravi, Nanak apparently slipped almost got crushed by the sea of people fleeing Pakistan and the trunk with silver utensils fell in the river. My grandparents’ entire life savings, their palatial mansion and the silver bricks were all lost forever, except for the trunk with gold jewellery that reached India. The three daughters-in-law in the picture would often wear the rescued ‘Sialkoti’ jewellery. My mother too, the bride in the picture, is wearing a kundan set from the trunk, gifted to her for her ‘doli’ (welcome gift to the bride) by my grandmother. By 1950, the family had settled down in Jullunder (now Jalandhar) where my grandfather was given the haveli (mansion) of a Muslim sessions judge who had left for Pakistan in 1947. The mansion at Patel Chowk, G.T Road in Jullunder City, was offered as “claim property” (in lieu of property left behind in Sialkot that was valued in crores). My grandfather, Papaji became the leading medical practitioner of Jullunder and was well known all over Punjab. The haveli in Jullunder was evaluated at Rs 1.35 lakhs in 1947. It had six bedrooms. The zenana (women’s section) was demarcated by a central Loggia garden and with a fountain in the middle. It housed several kitchens, pantry, store-rooms (with indoor-plumbing), a large hall, dining room and three floors of terraces each with a suite of rooms and kitchen, presumably for each of his three sons. My parents marriage was held in this palatial mansion in 1958. My father at the time was an army doctor attached to the 4-5 Gurkha Rifles and posted in Poonch , Jammu & Kashmir. Shortly after my parent’s marriage, one day when my grandmother and my mother were returning home in the afternoon from shopping, they saw a huge crowd outside their mansion with scores of policemen, jeeps, police trucks and cars with dark-green purdahs (curtains) on windows. Fearing the worst, they rushed in only to be apprised by my very stoic grandfather that the original owners of the haveli, two women from Pakistan with all requisite permissions and accompanied with police from both Nations, had come to claim some moveable assets they had left behind. My grandmother was furious and confronted the ladies from Pakistan, yelling at them, that the house had nothing except bare walls and an unkempt central garden when they acquired it as evacuee property. The ladies then firmly asked for permission to be allowed to go into the store-room adjoining the kitchen. My grandmother still shaking with anger and disbelief led the way, followed by the two ladies and policemen. Coming near a walled up alcove, the ladies gave it a few hard knocks with their hands using all their strength, and the makeshift wall gave way to reveal an 18” high glass shade of a shamadaan (candelabra), which was crammed to the brim with gold & stone-studded jewellery and gold & silver coins. All present in the hall just froze in awe and shock. The Pakistani ladies took possession of the treasure that they had come to claim, nearly a decade after the bloodiest Partition of two Nations in the history of mankind, where over one million people lost their lives. I am told, Nanak used to see a rat going into the walled up alcove through a small hole, where the treasure was hidden, for months and had even requested my grandmother’s permission to bring down the make-shift wall so that he could access a presumed “khazana” (treasure) for her, and she could maybe reward him for it? My grandmother feared that bringing down that wall may cause more damage to this magnificent evacuee property or may be it was something unpleasant that was “best left unseen”. My grandfather later became the Honorary Physician to Giani Zail Singh when he became President of India, a position he held until his death in 1986. My father received several awards in the Navy to which he was assigned by the Army Medical Corp (AMC). He was the 3rd and 6th head of the Physiology department of Armed Forces Medical College in Pune. He took charge from a Wing. Commander. Rao, father of Congress politician Renuka Chowdhury. My father, an octogenarian, now lives a very retired life in Delhi and my mother passed away in August last year. I often wonder if there were others who migrated from and to India & Pakistan had similar experiences to share? This entry was posted	on Monday, October 20th, 2014 at 12:21 PM	and filed under 1940s, 1947 India Pakistan Partition, 1950s, Abandonment, Accolades & Awards, Achievements, Architecture, Attire, Bungalow, Chiffon, Decor, Defence, Doctor, Dressed for an Occasion, Education, Elite, English, Exteriors, Fashion Accessories, Fatima Jinnah Medical College, Furniture, Hindu, Hindu Muslim, House of their dreams, Indian Clothes, Interiors, Jalandhar, Jewellery, Judge, Kashmir, Lifestyles, Maid/House Help, Markets, Men in Uniform, Men's Clothes, Migration, Muslim, Mysterious Circumstances, Name Change, Pakistan, Pre-Independence, Previous, Punjab, Punjab Province, Punjabi, Punjabi, Punjabi, Ravi, Rawalpindi, Relocation, Riots, Rivers, Salwar Kurta, Sarees, Shopkeeper, Shopping, Sikh, Sikhism, Silk, Specialised Clothing, Spelling Change, Universities & Colleges, Violence, Wedding Trousseau, Weddings and tagged with 1947, 1947 India Pakistan Partition, Ambala Jail, Amritsar, Arjun Dass, Armed Forces Medical College, army doctor, Army Medical Corp, Balakram Medical College, Doctor, Fatima Jinnah Medical College, Ghulam Qadir, Giani Zail Singh, Gurkha Rifles, Jalandhar, Jammu & Kashmir, Jewellery, Loggia, Marketplace, medical practitioner, Nathuram Godse, Nayar Bazar, Pakistan, Partition, Patel Chowk, Police, Poonch, Pre Independence, President of India, Pune, Punjab, Riots, River Ravi, Sialkot, Sir Gangaram, Treasure, Trunk Bazar. You can follow any responses to this entry through the RSS 2.0 feed. Hi I am from P Batch AFMC……. (1977-1981) My father and mother are both doctors…My father , Dr Milap chand was in 3/4 year Balak Ram medical college …when in 1947 he was allocated Stanley Medical College Madras….he is 89 years old and we all live at Palampur in Himachal Pradesh….do ask your Dad if he remembers anyone by that name…Cheers ! What a wonderful read !. I was your father’s student at AFMC Pune and have the highest regard for him. Wonderful man and a wonderful teacher. If it is not a problem I would like to go meet with him in Delhi: if it is okay with you and him can I have his address and phone number. You can send the address and contact number to my email address. Surg cdr HS Nayyar was an Examiner for my First Term Physiology Exam at AFMC IN 1967. Seeing my miserable performance, he asked me to re-appear after the vacation. A Gentleman & an Officer. Wish him good health & happiness. My father was also at Balakram medical college and was in his third year when partition took place . He finished his MBBS from GS Medical college and joined the AMC and served for appx 35 yrs !! “my father visited Bhera[distt Sargodha] in Oct.1957 to his ancestral home. The police went along and when the place where the gold was buried was excavated, the police took all but for a chain and locket [on my father’s request ]”. I heard a similar story, which could well be true. The Hindu family from Pakistan got a Muslim family’s house in India. After restarting their life, they finally managed to get all their children settled, their daughters married, etc. Only once the old couple were done with their duties, but still living within the same old walls since Partition, they decided to redo the house, to make more room for their sons’ growing families, all still with the old parents. When breaking down the old house, they found a biscuit box, buried under the cemented threshold, full of gold coins – ginnis, or guineas. This, in the late 1960s. They took the box to the Indian authorities, who told them it was theirs to keep. I like to believe it is a true story! I am Abrar, Grand son of Khan Bahadur Sheikh Inayat Ullah of Ghulam Qadir family Sialkot, and my father’s name is Sheikh Muhammad Yousuf. I have read your story and also heard about Dr.Dr. Gurbaksh Singh Nayar sahib. I think one of your family member was the class fellow of my late father in Murray college Sialkot? My father was running a hotel in Ambala (Perry’s hotel) and my uncle who visited the site and met with the present owners as well. I have heard many good stories from my father and I visited India three times (Delhi twice and Bombay once). I am working with many Indian colleagues here in Saudi Arabia and wish to visit your great country and see some places that my late father used to tell me. I do not know why getting visa for India is so tough for me but one day I will certainly come to visit Ambala and take lots of pictures. I wish we have a long lasting peace and leadership on both sides realize the fact that we need each other. Let us hope that good sense prevails, and that, one day, the doves win over the hawks. Thank you Indian Memory Project! @ Abrar: God is Great! Papaji n Bhabiji mentioned your respected grandfather many many times…they even took refuge in his house when pre-Partition riots broke out in Sialkot! If I rem correctly he ran the biggest departmental store with its own cafe way back then!? Was a very rich man but also my grandfather’s dearest friend! My father studied in Murray college for pre-med, n his brothers too did their FA from this college. Prior to that they all studied in Ganda Singh High School! My father will be overjoyed to learn about you, n , I plan to call him this evening! Loads of warm regards to you n your family…tell me more about Sialkot n do post some pictures if possible? Thank you for reconnecting…. Dear Abrarbhai : My Dad was overcome with emotion. Your late respected father Yousufji was a batch-mate of his older sister Raj in Murray College! He remembers your father as being an excellent hockey player too! He also remembers an uncle of yours named Raja . And he has sent you his love n blessings! The story is really very nice. Really touched after reading the same. all the best. What an amazing story! God bless your father and all others in your family. Wonderful story. Your grand parents/parents gave away what was not their own.God gave your parents so much honour,recognition and status which no wealth can give.